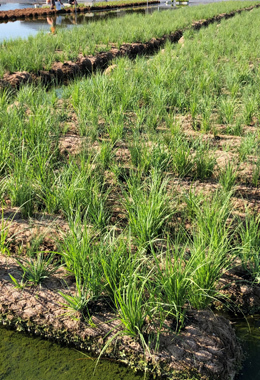 Description: Coir logs are an ideal way to establish sedges and willows along steep, erosion prone areas where extensive grading is not practical. They are pre-grown with native species that are fully rooted throughout the coir matrix. The dense coir logs provide immediate erosion control while the native plants root into the substrate to increase bank cohesion. Coir logs have minimal soil requirements and can tolerate fluctuating water levels in just a few weeks. They are available in a variety of sedge and woody species.